In truth losing weight is not rocket science, the key is eating healthily and exercising. I have worked with overweight clients and seen good results. I will ensure you have a programme of exercise and nutritional advice which, with support, will lead to weight loss over the longer term. This is the million dollar question! No doubt you will have been bombarded by media images and advertisements telling us the latest fast and easy way to lose weight. 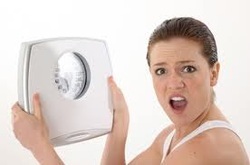 There are countless weight loss diets that tell you they can help you lose weight and lots of it. Well I'm here to tell you that in the short term yes you may, but as soon as you relapse back into your old ways the weight will come back, and twice as fast. The information for these "quick wins" can be confusing and misleading. Check out my blog to see articles which explain things in more detail and offer some solutions. Basically, when all is said and done, you need to understand a few simple strategies which underpin weight loss. When I say weight loss I mean long term and not just a two month flirt with losing weight only to see it pile back on. 1. Eat a Balanced Diet - Take in plenty of protein, unsaturated fats and do not overload on carbohydrates. 3. Eating Technique - Chew your food! Eat slowly and your body will tell you when you are full. 4. Don't Pick on Poor Food - Most of us do it! Or have done it! Cut out the biscuits, chocolate, cakes , crisps etc. We do not need them! 5. Move/Exercise - We are designed to move and need to move our bodies and not sit around. Active bodies burn more calories and therefore burn off stored fats as a source of energy. Notice how when you sit around and are not active we feel lethargic and stiff as a board! Your body is a sophisticated structure designed to move, so sitting around and being idle will cause it not to function correctly. Just look at the number of people with joint/mobility issues, bad backs, etc. You only have one body look after it!